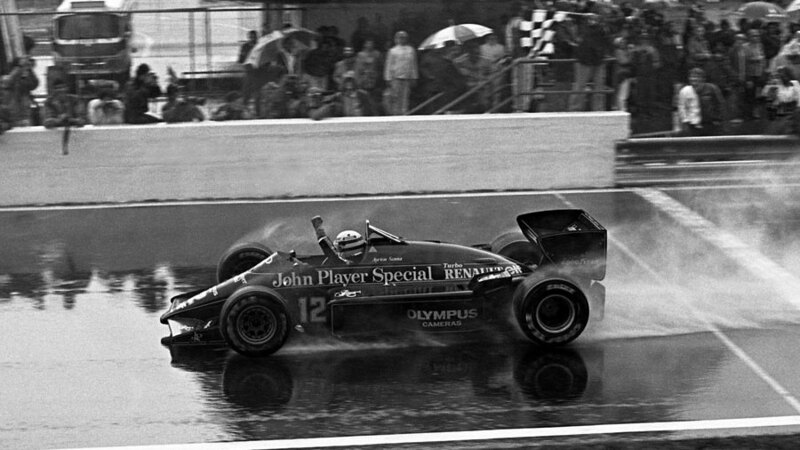 In appalling conditions, Ayrton Senna won the Portuguese Grand Prix for Lotus, his first success in Formula One and confirmation that the form he showed in the opening round in Brazil was no one-off. His win gave Lotus its first success in three years. In Monaco the previous year the rookie Senna had set a marker with a brilliant drive in an underpowered Toleman in terrible weather to come within seconds of beating Alain Prost. If anything, what faced the drivers at Estoril was worse with driving rain turning the circuit into what The Times described as "a skating rink". While others fretted, Senna was unphased. The rain started on the warm-up lap - Senna had already taken pole - and he got the all-important good start and was never threatened. Michele Alboreto brought home his Ferrari in second but was more than a minute behind and the only man on the same lap as the Lotus. It was nevertheless enough to take him to the head of the drivers' championship. Most others had forgettable days. Keke Rosberg stalled his Williams on the grid and although he got going he crashed on the main straight, injuring his hand which got caught in the steering wheel. Prost aquaplaned on the home straight and smashed into barriers - he was unhurt but shaken. Defending champion Niki Lauda retired with a broken piston. Behind the leading two Patrick Tambay had one of his increasingly rare good days, growing in confidence throughout and finishing third ahead of Elio de Angelis in the second Lotus, who was slowed at the end by a slow puncture. There was an inauspicious debut for the one-car Zakspeed team when Jonathan Palmer hit the stationary Rosberg on the grid at the start and was forced to retire two laps later with suspension problems. Rosberg had also had an eventful Saturday practice when he hit a wall, while new team-mate Nigel Mansell was hit side-on by an out-of-control Riccardo Patrese. Mansell recovered to finish fifth in the race itself despite having to start from the pit lane.